Nonito Donaire, Jr. (left) and trainer Kenny Adams. Former US Olympic coach Kenny Adams yesterday declined to predict the round where “super” WBA bantamweight champion Nonito Donaire will knock out WBO counterpart Zolani Tete of South Africa but said a body shot will settle the unification World Boxing Super Series (WBSS) semifinal bout at the Cajun Dome in Lafayette, Louisiana, on April 27. 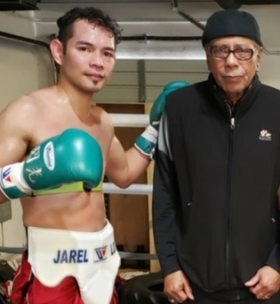 Adams, 78, has been busy working with Donaire in the gym in Las Vegas to prepare for Tete. They got together for the first time when Donaire stopped previously unbeaten Ryan Burnett at the end of four rounds to wrest the WBA crown in Glasgow last November. Tete, 31, has a four-inch reach edge and he’s expected to use it to stave off Donaire with his right jab. A southpaw, the South African hasn’t lost in his last 12 bouts and his last defeat was to Roberto Sosa by split decision in Argentina in 2012. Tete’s record is 28-3, with 21 KOs, including 13 in the first round. He’s not only rangy but also heavy-handed. Donaire, 36, has a record of 39-5, with 25 KOs. It isn’t easy to go down two weight divisions to win a world title but that’s what Donaire did. He dropped down from featherweight to bantamweight to beat Burnett. The last fight where Donaire scaled within the 118-pound limit was in 2011 to beat Omar Narvaez on points and that was 16 bouts back. Henry Armstrong went from welterweight to lightweight to capture the world crown in 1939 but never lost weight doing it because he used to fight in the 147-pound division weighing 135 or less. Donaire is the only fighter ever to bring down his weight by at least eight pounds to win a world title. Adams, who has worked with over 30 Olympians more than 60 world champions, said Tete doesn’t stand a chance against Donaire. “I won’t call the round but Nonito will knock him out with a body shot,” he said. “When people wish me luck for a fight, I say thanks anyway but I’d rather go with skill than luck. That’s what will make Nonito win over Tete.” The winner of the Donaire-Tete fight will advance to the WBSS final against the survivor of the May 18 duel between Japan's Naoya Inoue and Puerto Rico's Emmanuel Rodriguez in Glasgow.